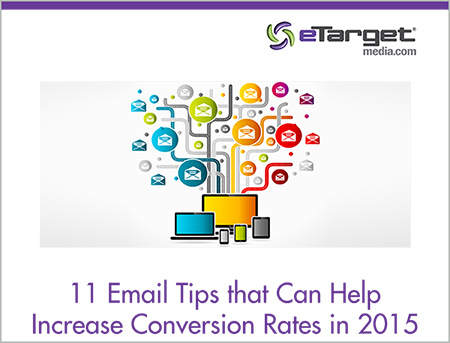 eTargetMedia, a leading provider of Email Lists, Postal Lists, Data Append and Creative solutions, announced the 11 Email Tips that Can Help Increase Conversion Rates in 2015 Tutorial, a presentation that helps marketers effectively increase conversion rates on their email campaigns. The new year gives marketers a fresh start to plan their email campaigns and eTargetMedia is helping by offering free tips that can dramatically increase sales, conversions and leads from targeted email marketing. For a limited time, eTargetMedia is offering a free consultation to customers who mention the tutorial and 10% off new email list orders. eTargetMedia works with some of the top brands in the world and has helped clients like BMW, Celebrity Cruise Lines, Mercedes, MetLife, TGI Fridays, Nissan, Subway, Anthem, Acer and more to increase their email conversion rates by increasing website traffic, store traffic, website leads and sales. eTargetMedia’s knowledge of the industry, experienced account managers and reputation for following all industry standards have helped the company become an email marketing leader, producing measurable results in traffic, customer acquisition, and revenues. eTargetMedia’s tips for increasing conversions tutorial can be used to create email messages that capture customers’ attention so they open the email, engage customers so they act on the email, and ultimately result in sales for the business. Among the tips included in eTargetMedia’s 11 Email Tips that Can Help Increase Conversion Rates in 2015 tutorial are how to write compelling subject lines that will motivate receivers to open the email, how to personalize emails, how to include call to actions that will increase conversions and how to target and segment email campaigns to maximize ROI. eTargetMedia, based in South Florida, provides Email Lists, Postal Lists, Data Append and Creative Solutions to a wide variety of direct marketing customers. eTargetMedia is a member of the Direct Marketing Association. Visit eTargetMedia online at http://www.eTargetMedia.com. In the world of online marketing, it doesn’t get more potent than a strategic email marketing campaign. While most marketers can agree on that statement, many are unclear on the dos and don’ts of an effective email message. In this blog post, eTargetMedia covers one of the major don’ts of email marketing — batch-and-blast emails. Also called broadcast emails, a batch-and-blast email campaign is no longer considered an effective way to reach your target audience. Why? There are many reasons, the first of which is most important: it’s not permission based. According to Direct Marketing News, many companies are still sending out broadcast emails, but these types of campaigns are not permission based. Another reason is context. With the rise of location-based marketing, the article suggests that today’s effective email campaign must be “relevant and timely,” which means taking into account important data such as when and how subscribers open their emails. So what’s in? Triggered emails. Unlike batch-and-blast campaigns, triggered emails are “capturing an increasing share of program revenue.” In fact, the article reports that some major companies receive the most of their email marketing income from triggered emails. So if you’re still using batch-and-blast, it’s time to reconsider your email marketing tactics. eTargetMedia can help you create a permission-based email marketing campaign that meets your demographic criteria and drives results. Email marketing is arguably the most valuable type of online marketing. But when it comes to creating an email marketing campaign, many run into some serious problems getting and using new forms of data. According to StrongView’s 2015 Marketing Trends Survey, one of the top concerns for marketers heading into 2015 is “accessing and levering customer data from multiple channels and data sources.” About 30 percent of marketers fall into this category. While marketers are willing to invest in email marketing, the wrong data or lack of new forms of data will not yield optimum results. According to the survey, only half of the marketers surveyed use commonly held data in their campaigns. About 51 percent use demographic data while only 48 percent use purchase-history data. Another problem many marketers face is the inability to find important data. For example, 31 percent of the marketers surveyed in the report are unable to leverage data related to web behavior, 20 percent can’t find data related to sentiment, and 19 percent are unable to leverage life stage data. If you’re going to invest in email marketing, make sure you can access and leverage the right kind of data. eTargetMedia has always harnessed the power of email marketing using an exceptional amount of valuable data. Our strategic targeting campaigns leverage data such as purchasing preferences, interests, demographics, geography, and more. Contact eTargetMedia to learn more about how we can effectively reach your target audience so you can experience a growth in sales, conversions, and ROI. eTargetMedia has always recognized the power of a strong email marketing campaign, so we were thrilled to see that more marketers are on the same page. The survey reveals that 61 percent of marketers say that they will increase their budgets for email marketing in 2015. They also plan to spend more money on social media (49 percent) and mobile marketing (40 percent). In addition to spending more money on email marketing, marketers are clear about exactly what type of email marketing they want to invest in. According to the survey, marketers plan to focus on automating programs. The survey reveals the top two types of email marketing programs that will see the most investment: triggered (42 percent) and lifecycle (41 percent) programs. In the category of lifecycle programs, marketers plan to invest more money in Loyalty (45 percent) and Welcome (36 percent) programs. If you want to reach your target audience, email marketing is the way to go. eTargetMedia specializes in email marketing and can tailor a strategy that will boost revenues, increase traffic to your site, and effectively reach your target audience. Email is the number one direct communication channel in terms of daily use. Both consumers and business professionals use email on a daily basis to communicate with friends, family, clients, and potential customers. Email is thriving. Smart phones and tablets are making it even easier to access our email anytime, anywhere. Businesses all around the world use email marketing to boost sales, generate leads, strengthen relationships, increase website traffic and build customer loyalty. This is why it is so important for your business to have a powerful email marketing strategy in place. The top things you need for a successful email marketing strategy are an opt-in, targeted email list, an effective creative email message and a comprehensive tracking program that lets you monitor and analyze your email campaign results. When planning and executing your email marketing campaigns, it is important to pay close attention to your audience and customize your email messages to their interests so your customers stay engaged with your email messages. Before you start your email campaign, you should develop an email marketing strategy that sets your goals and objectives for the campaign. Use email marketing to generate leads, increase sales and revenue, strengthen customer relationships and build brand awareness. You can build a permission based email list by asking your customers to opt-in to receive your email messages. By offering your customers something of value such as a special discount, a free download, or more information about your products or services, customers are more willing to share their email address with you. Reach potential new customers by renting a targeted, opt-in email list from an email list company. An experienced email list company can help you plan and manage your entire campaign from email planning to list selection to creative development to email delivery and tracking. Experienced email companies can often get the best rates on email list rentals. Create segmentation criteria that will help you target your messages to the right audiences. Look at specific demographic, psychographic, and geographic qualifiers. Use the complex segmentation criteria to make sure your offers are more customized to meet the needs of the email receiver. Consider doing A/B splits to send out different messages to different segments. Think about your message and what you want your audience to do after reading the email. Customize your message based on the interests of your audience and include value added content or special offers to help increase engagement with your emails. Include call to actions that tell your audience what to do next. By including call to actions like buy now, download now, and contact us, you can increase the conversions of your email campaigns and improve your ROI. By testing different offers, different lists, subject lines, call to actions and creative, you can greatly improve your conversions and ROI and see what works for your audience. Test different delivery days or different times and see what your audience responds to. Always make sure to test your final email with an in-house test group to make sure everything loads correctly, all of the links work, etc. Listen to your customers, personalize your email messages and add relevant content to engage customers with meaningful email marketing campaigns. Include links to your social media pages so your audience can connect with you through all of their favorite social media sites. Include custom trackable links in your email campaigns so you can test and analyze different email elements. Track opens, clicks, leads, conversions and unsubscribes. When running ongoing email campaigns, tweak your email campaigns as soon as you see the first results. Measuring your email campaign results is the key to understanding what works and what doesn’t so you can continue to improve your results for future campaigns. Incorporating these tips into your email marketing strategy can help you increase your results. Email is the leading direct channel in terms of daily use and consumer preference for both personal and marketing communications. Email marketing has a massive potential reach and most consumers have indicated that they prefer to be contacted by brands through email communications. According to a recent email study, 64 percent of marketers indicated that their company’s spend on email marketing were set to increase. Email is a great and cost-effective way to reach a high volume of consumers and through correct targeting, it can generate more leads than any other marketing channel. Social media, text messaging, likes, shares and tweets, have become increasingly popular but email still remains the most effective way to engage customers with targeted marketing communications. Mobile devices have also allowed consumers to receive email messages anytime, anywhere. Email clearly still plays a huge role in marketing communications. 77 percent of consumers listed email as their preferred channel for receiving opt-in marketing communications. Only 6 percent chose social media and 5 percent chose text messages. For every $1 spent on email marketing, the average return on investment (ROI) is $40.56, according to the Direct Marketing Association (DMA). Around a quarter of email accounts are corporate accounts, making email marketing well suited to B2B as well as direct consumer marketing. Consumers use email more frequently than any other media channel. 91 percent of consumers stated that they checked email at least once a day. Only 57 percent of consumers stated that they use Facebook daily, 14 percent stated they check Twitter daily and only 10 percent checks LinkedIn daily. Only 57 percent said that they use text messaging daily. Email is used more frequently than social media, text messaging, and instant messaging on a daily basis. A targeted email marketing campaign can help you reach new customers, generate leads, maximize your ROI and increase revenue. Integrate your email campaigns with your social media and online advertising campaigns and you have far more chance of engaging each customer and maximizing your marketing dollars. Contact us today to find out how we can help you.